“I wish those guys were here because I enjoy sailing against them,” said Alexander, who hails from Ocean Springs, Mississippi. Alexander loosened up the rig prior to the fourth race because the squall that came through caused the wind to lighten. However, the breeze built back up into the mid-to-high teens during the race. 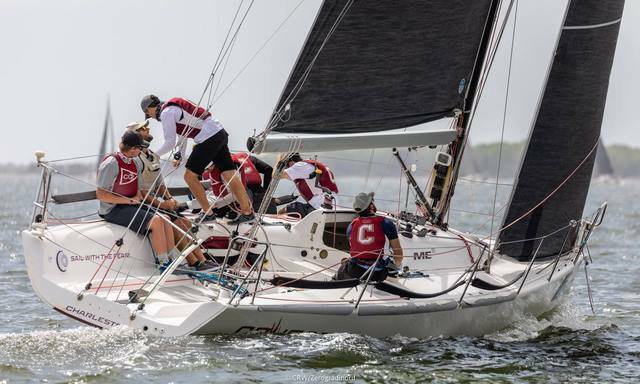 Former College of Charleston All-American Reed Baldridge is steering Tudo Bem, the entry led by skipper Michelle Warner that is one point behind Counterproductive. Bruno noted the average age of his crew is 60 with bow man Jonathan Asch checking in at 66. 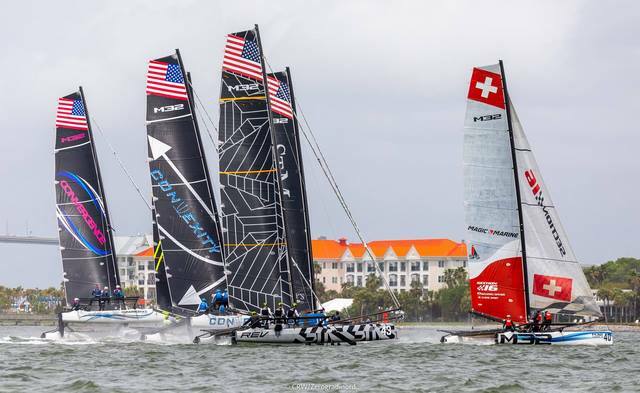 Stuart Johnstone called tactics, Chris Morgan trimmed the main while Steve Lopez and Tim Randall teamed to trim the headsails aboard Wings. Skipper Travis Weisleder and his Lucky Dog/Gill Race Team rallied to victory in Melges 24 class, which attracted 37 entries. Anthony Kotoun called tactics for Weisleder, who steered Lucky Dog to first place in Race 10 to move into a tie with Monsoon. Monsoon, skippered by Bruce Ayres of Newport Beach, California, was the Day 1 and Day 2 leader, but could not close things out after finishing fifth in the final race. 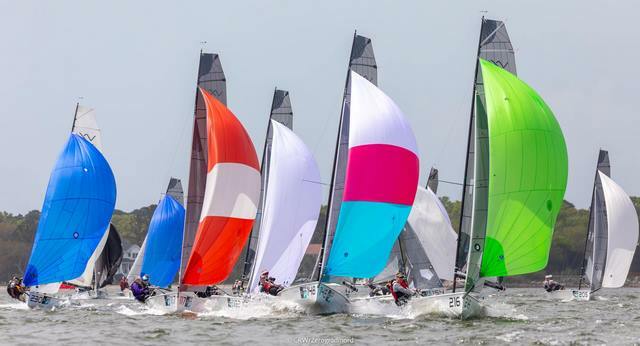 Weisleder, a marketing director for several car dealerships in Richmond, Virginia, has been sailing with headsail trimmer John Bowden for eight years. However, this was the first time Kotoun had been aboard while Jane Buckley was a fill-in on the foredeck. Caroline Main (floater) completed the revamped crew, which came together quickly. 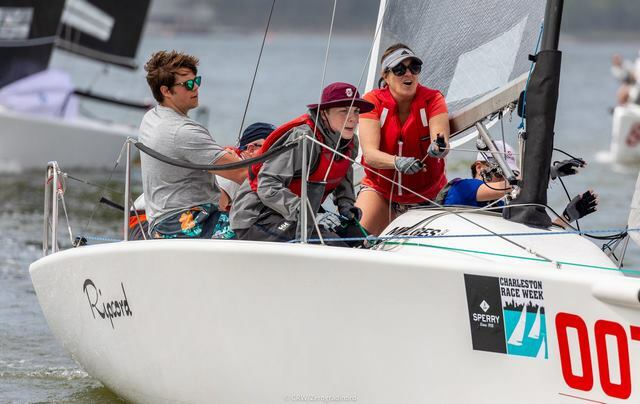 “Anthony did a good job of putting us in the right positions and we’ve been really, really fast all week – both up and down,” said Weisleder, a former College of Charleston sailor who has been racing in the Melges 24 class since 2000. 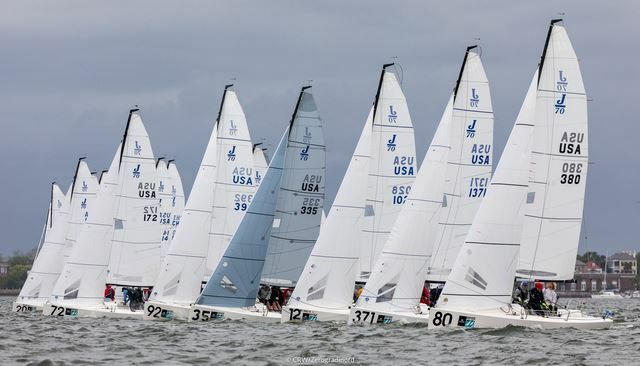 The Bay Head Yacht Club member has missed just four of the 24 Sperry Charleston Race Weeks held to date and last captured Melges 24 class in 2008. This year’s edition will be memorable for Weisleder, who received the Charleston Race Week Cup, presented for best overall performance by a one-design entry. 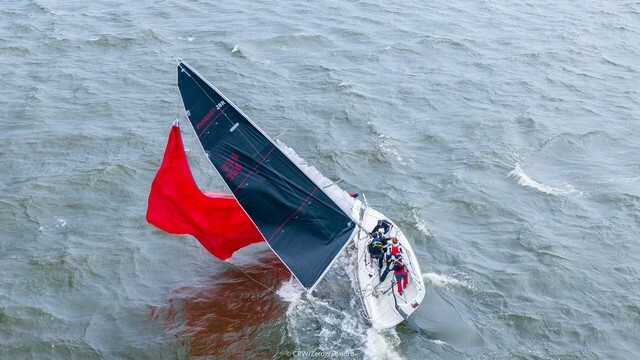 Teamwork, a J/122 owned by Robin Team of Lexington, North Carolina, earned the Palmetto Trophy for the fifth time at Sperry Charleston Race Week. Jonathan Bartlett called tactics on Teamwork, which won all six races in ORC B class on the Hybrid Pursuit course. 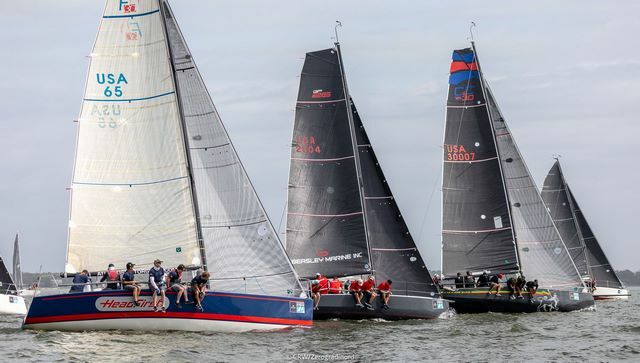 “We’ve been coming to Charleston for a long time and we absolutely love this regatta,” said Team, whose previous Palmetto Trophy wins were as top PHRF entry. 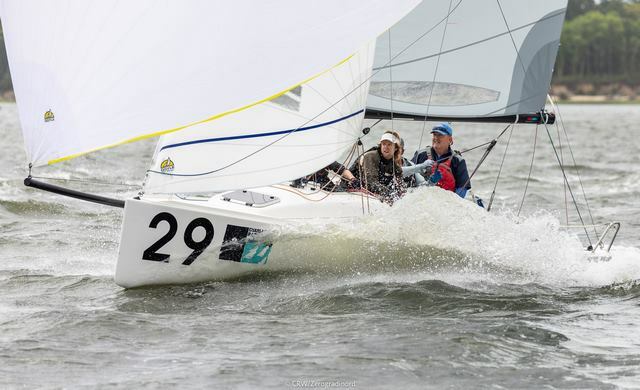 Now Teamwork has another one for the shelf for best performance among ORC entries after duking it out with the J/111 Sitella (Ian Hill, Chesapeake, VA). Mike Beasley and his team on Rattle-n-Rum was the two-time defending champion of ORC C, a class comprised of a nice mixture of sport boat designs. 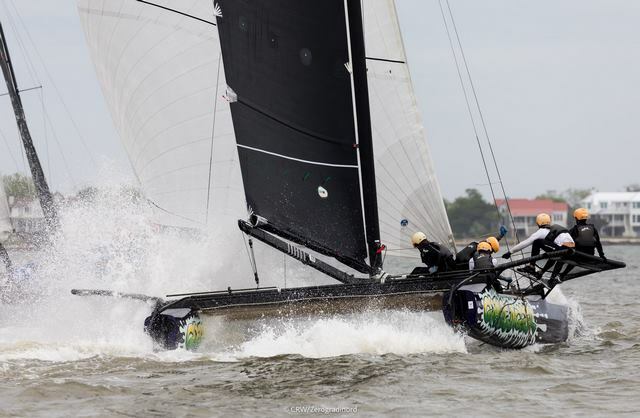 However, the Annapolis entry found itself sitting in second place behind the Farr 30 HeadFirst3 going into the last day. 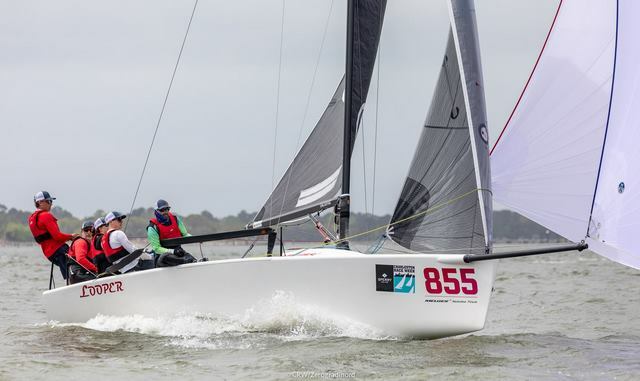 Beasley’s GP26 performs extremely well in high winds and posted a pair of bullets on Sunday to force a tiebreaker with HeadFirst3, a Canadian entry skippered by Peter Toombs. 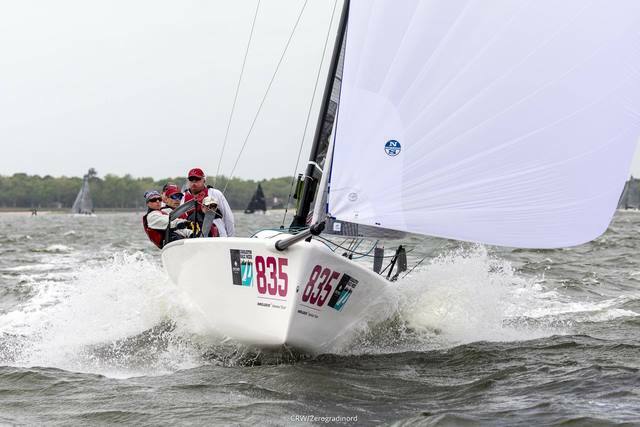 Rattle-n-Rum won two more races than the Farr 30 and is now a three-time champion as a result. Joe Gibson served as tactician aboard Rattle-n-Rum, which trailed HeadFirst3 by two points after two days of racing. Teddy Haaland (bow), Joanna Haaland (runners), Matt Weimer (main) and Ryan Rutkowski (floater) made up the rest of the team. 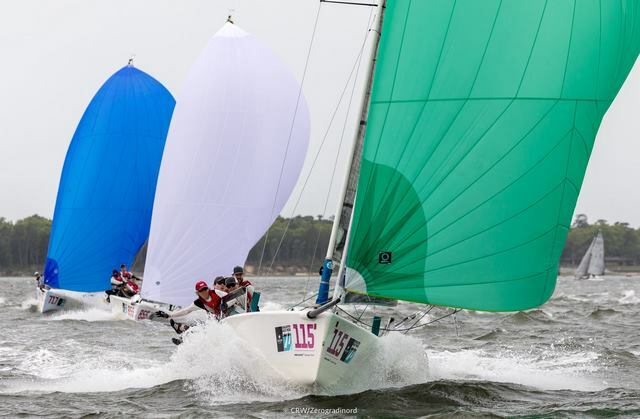 Tudo Bem and Counterproductive traded the lead back-and-forth in VX One, which had 30 boats. Class newcomer Michelle Warner and her Tudo Bem team pulled somewhat of an upset by beating reigning North American champion Chris Alexander and the Counterproductive crew by a point. Former College of Charleston All-American Reed Baldridge steered Tudo Bem, which finished fourth in the final race to overtake Counterproductive after Alexander absorbed an eighth. Austin Powers was the third member of the Tudo Bem team, which was racing a chartered boat. After winning her first regatta, Warner is seriously considering buying a VX One. “We’re definitely coming back next year and hopefully I’ll be sailing my own boat,” she said. Kevin McCarthy skippered Chance V to a one-point victory over NESS in Viper 640 class. The Fort Lauderdale resident had Steve Flam as tactician and Mike Pentacost, another Viper 640 owner, in the forward position. McCarthy made his Viper 640 at the Bacardi Cup, but lasted just one race due to a breakdown. He previously raced in the Melges 24 and Flying Dutchman classes. 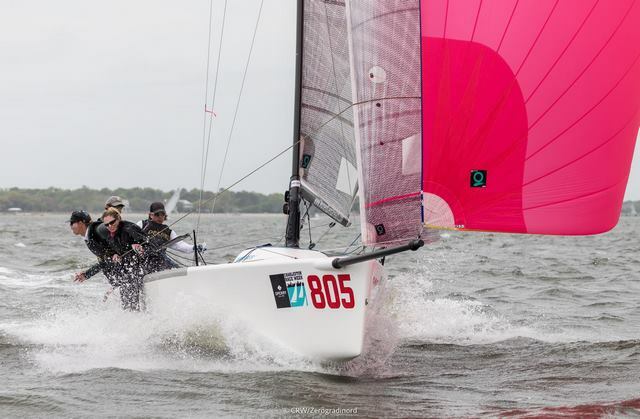 Joel Ronning and his Catapult crew secured a surprisingly convincing victory in J/70 class, largest of the regatta with 56 boats. Victor Diaz De Leon served as tactician on Catapult, which won six of nine races in posting a low score of 20 points – 20 better than runner-up Rosebud (Pamela Rose, Aventura, FL). Diaz De Leon joined the team about six months ago and Ronning has been impressed by the way he’s blended in with holdovers Christopher Stocke (bow) and Patrick Wilson (headsail trimmer). 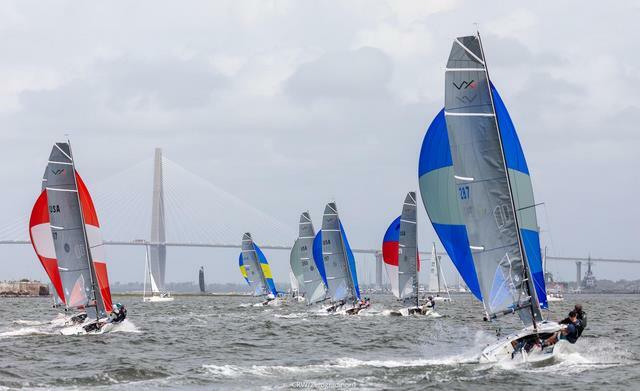 Carter White skippered YouRegatta to the most dominant victory of 2019 Sperry Charleston Race Week, winning seven straight races in J/24 class after placing second in Friday’s opener. 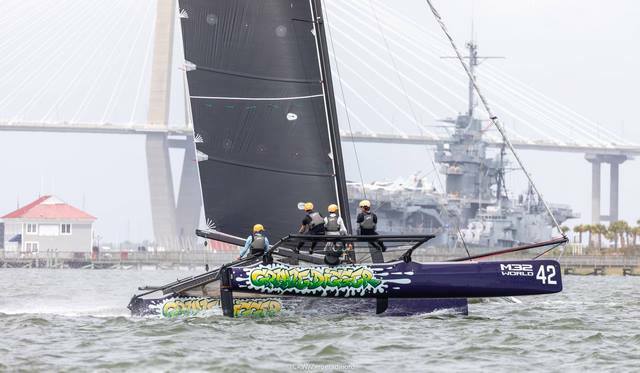 YouRegatta did not start Race 9 and still finished 12 points clear of Level Pelican (Crisp McDonald (Charleston, S.C.). Molly White worked the bow for her husband, who has been racing a J/24 for more than two decades. Michael McAllister called tactics, Ted Wiedeke trimmed the spinnaker while Chris Lombardo trimmed the genoa. 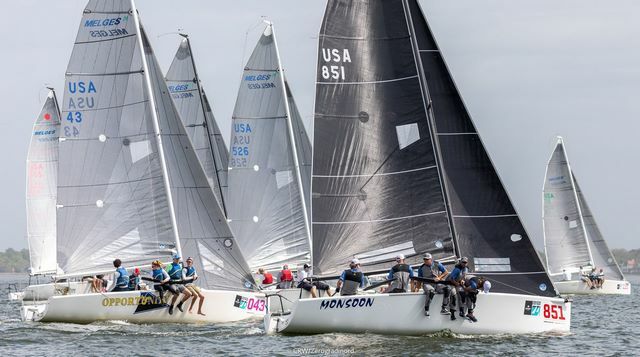 Shenanigans came away as winner of J/80 class following a tight three-way battle with fellow Annapolis entry Eleven (Bert Carp). Shannon Lockwood steered while her father Bill trimmed the main. Jeff Todd handled headsails while his daughter Cassie worked the bow. 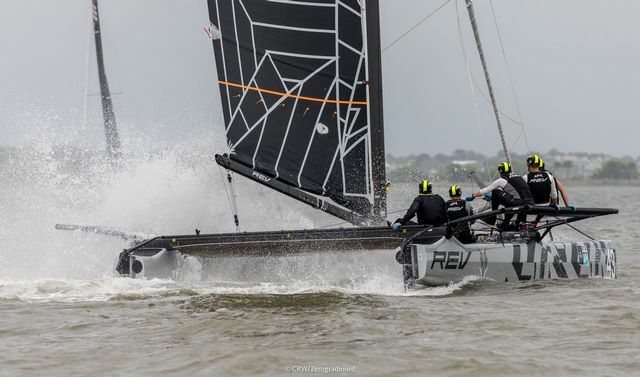 The high-performance M32 catamarans made a spectacular debut at Sperry Charleston Race Week, thrilling spectators by zipping around Charleston Harbor at high speeds. 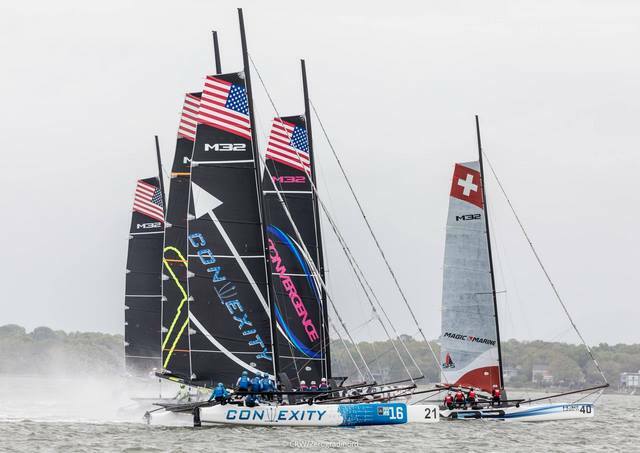 These amazing machines completed 13 races in just two days with Don Wilson skippering Convexity to a commanding 16-point victory on the strength of six bullets. 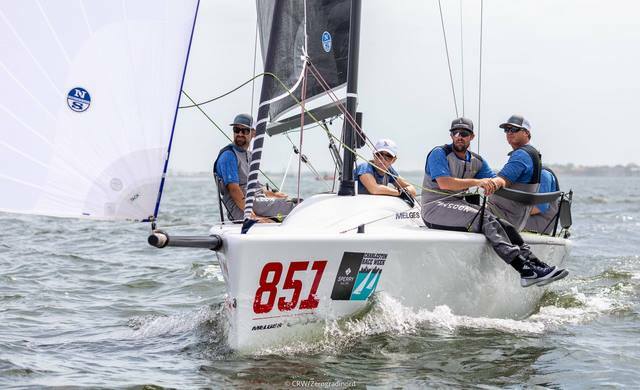 Amy Baxter completed a wire-to-wire win in RS 21 class, which also made its debut at Sperry Charleston Race Week. The Chicago resident won seven of nine races while taking third in the other two in totaling 10 points, 14 better than Zim Sailing (Bob Adam, Bristol, RI). Jake Sorosky (tactician), Kevin Coughlin (jib) and Danny Lawless (bow) crewed for Baxter. This was the first sailing experience for Rassmussen, who gave credit to Hodges for helming and coaching at the same time. “Sammy was awesome about keeping us on point and teaching all the little nuances,” he said. Finally on the last day of competition the wind gods permitted the ORC Hybrid Pursuit entries to enjoy the intended three-race daily format: a morning pursuit distance race from the harbor to the offshore course area, followed by a windward-leeward buoy race, and ending with another distance race to the harbor. “This Hybrid Pursuit style was well received by all the boats and we enjoyed it,” Team said. Principal race officer added a second windward-leeward race to make up for the fact Saturday’s Hybrid Pursuit was abandoned. 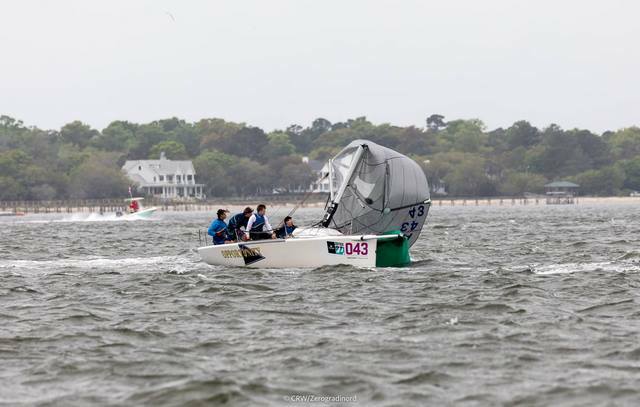 ORC D was won by Skimmer, a locally-based J/105 team led by Miles Martschink and Ben Hagood. A pair of Charleston entries came out on top on the regular Pursuit Race courses with Wadmalaw Island resident Bill Hanckel skippering Emocean to a two-point victory in Spinnaker PHRF A and John Springer leading Direction to first place in PHRF Non-Spinnaker by tiebreaker over fellow Mount Pleasant resident Mark Fanning on the Sabre 452 Sea Biscuit. “We came out and sailed our best race with the regatta on the line. We know our competition, know how to sail inside the harbor and offshore and we fought hard,” said Caroline Baity, main trimmer aboard Direction, a 47-year-old design known as a 30/2.